Science tells us what we, as music educators, already know: music is good for brain development. We constantly see study after study that verifies what we see on a daily basis in the young musicians with whom we interact. Recently, a study at the University of Southern California’s Brain and Creativity Institute indicated that early exposure to musical instruction increases the development of the brain in children below the age of seven. The study reenforced the connection of music and stronger math, language, and reading skills. And we also know that when you make music with another person, you are more likely to empathize with them. Children in the music group…had stronger brain response to differences in pitch compared to the children in the other groups. We also observed that musically trained children had faster development of the brain pathway responsible for encoding and processing sound. This finding supports previous findings and highlights music’s important benefits particularly in the development of language and reading. As it turns out – these benefits can last a lifetime. Musical experiences like Kindermusik at Hive Creative Studios, can increase brain capacity and the level of active connection between different areas of the brain. So much of brain development occurs in the first seven years of life; these are the years that music can have an incredibly positive impact on the process and well beyond. So get involved! Check out a class near you and see how our award-winning curriculum can enrich the life of your child…and you. 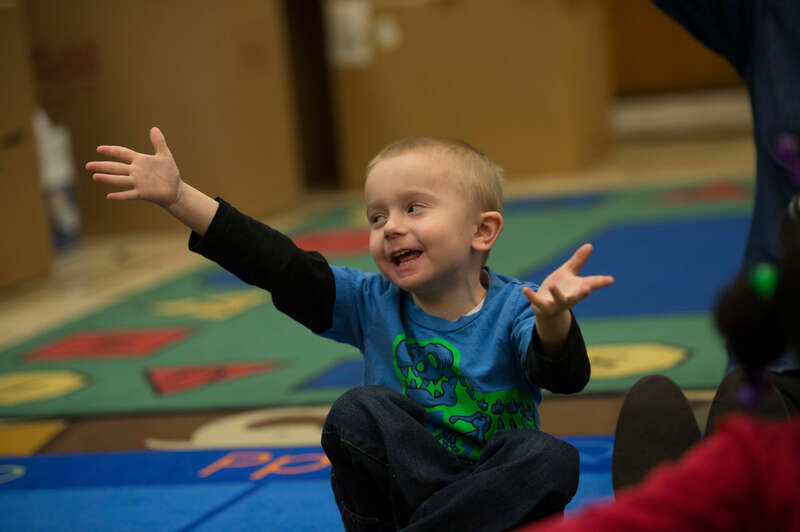 Our classes involve music, movement, and lots of fun. We help your kids develop big brains!